Never in my life would I imagine undertaking so many DIY projects around the house, both with my husband and without. What I have learned is a good set of steps can take you far. We paint, redo, change things up, clean gutters. tall ceilings, change lights in cathedral ceiling fixtures, cobweb, add electrical boxes and so much more from tall places in our home and being short definitely has me at a disadvantage. It would seem that some of the easiest tasks become much more complicated when you are a petite-framed 5’2″ and that many things are out of reach without the help of a simple ladder. Often though, there are tasks that need those taller ladders, like taking the sheers down from a tall ceiling main window in a hallway or hanging pictures on an exposed staircase. What else I have discovered is that we buy too many things to get a job done, such as a ladder at every height to fit every situation and really that is unnecessary. Lavishly live DIY out loud with this fabu find that will have you stair-climbing, painting, changing bulbs and climbing flush against walls without ever questioning your stepping again. What is the Little Giant Select Step Ladder? The particular model I worked with was able to go from 5-8 ft tall. This is a lightweight ladder that I could move anywhere I was going and it has wheels. It is very strong(Type IA 300 lbs ANSI Rating) and there is a COMFORT STEP that allows for solid standing on a platform while part way up the ladder, it is very solid and it feels as though you are not mid-air rather ground. Each side of the ladder telescopes incrementally, sliding to the desired height and angle is very easy, meaning if I need to work on a staircase or a sloped ground I can do this without a second thought. If you are painting shutters on the house chances are you are sloped(well we are anyway) so I can match the terrain with this ladder. I can work at a 90 degree angle and I can make either side of the ladder work in the direction I need it to. Working on staircases is no challenge at all, and working against windows or tall bookcases just got so much easier. I can be flush against the wall, really feeling more secure than ever. This can be the most basic ladder in it’s original position or you can slide it to work those uneven surfaces, it is ONE ladder that does it all. How many times have you gotten to the top of the ladder, when suddenly you realized that the extension cord should have been wrapped somewhere safe or your nails did not travel with you or some of your tools. How do you get all this stuff up with you and stabilized? The answer AirDeck. This is an amazing little platform that has a few positions to help you out. You can jettison this out from your main level, or you place it up to hold onto as you go higher on the ladder and it lets you steady yourself for balance. 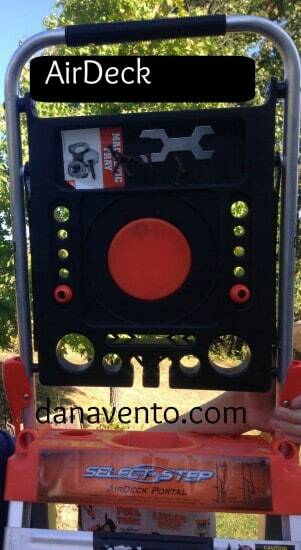 You flip it over and it is right at your hands-level to use it for whatever you need while working. This is so easy that my son even was able to use and maneuver it, take a look. This is him extending and closing the Select Step with ease. He also was able to take the AirDeck and place it on and off. We tried every possible configuration and it was a breeze to operate. The Rock Lock allows you to raise the ladder to the desired height and then securely lock it into position with the traditional ropes and locks. 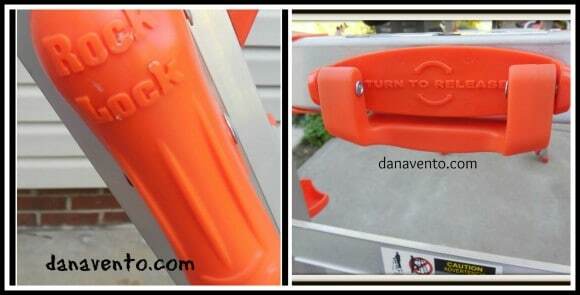 The Grip Handle unlocks and locks the rear legs of the ladder and again locks securely making it very easy to change heights on this ladder. If you have many different tasks that you are pulling multiple ladders out for, you really need to get a Select Step Little Giant Ladder. This was easy to maneuver and I am hardly a large person. 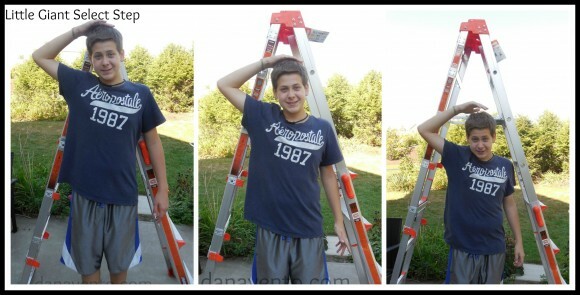 My son did the demos for you so you could see that even a teenager with basic strength can make this ladder work. The uses are endless and the possibilities of workloads, limitless. Lavishly live DIY out loud with a great DIY helper.